Congenital scoliosis results from some structural abnormality that occurs before birth, during fetal development. There are 2 distinctive forms of congenital scoliosis including curvatures which directly occur in a fetus and congenital conditions that dispose children to develop scoliosis as they grow. 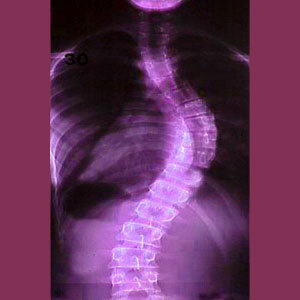 Congenital basis for scoliosis is an interesting topic, since some doctors believe that many cases of idiopathic side to side curvature form later in life as a result of circumstances that are already set in motion during the fetal development stage. This changes everything from a diagnostic viewpoint, since idiopathic conditions are now being increasingly linked to possible contributors that occur during pre-birth. This interesting article explores the diversity of congenital lateral spinal curvature scenarios. We will examine the contributors and lifestyle factors that can cause congenital variety scoliosis and share some fascinating research on the subject of pre-birth scoliotic formations. Some fetuses already demonstrate the characteristics of scoliosis before birth. Others do not, even though they have already been affected by atypical structure in the spine that will dispose them towards displaying scoliosis as they grow-up after birth. Some children will immediately begin to show the evidence of congenital abnormalities in the spine as infants or toddlers, while others might not demonstrate the visual proof until they reach the growth spurt of adolescence. This is why diagnosing congenital forms of scoliosis is quite challenging. True congenital side to side atypical spinal curvature will be present before birth and can be diagnosed via various imaging studies. Since these cases are thought to be some of the worst in terms of likelihood for progression, some expecting mothers-to-be unfortunately choose to terminate their pregnancies, rather than expose the child to such risks from birth. However, many children are carried full term and delivered successfully, despite having scoliosis. Some of these children many be born with additional health issues or the very real chance of enduring added suffering from day one of life as their spine changes in response to each new day of growth. Other children seem anatomically normal during the fetal stage, yet still demonstrate evidence of spinal abnormality that has not yet been discovered. These irregular structural issues will make it likely that the child will demonstrate scoliotic formation at some point during their early growth cycle. As always, the earlier any type of scoliosis begins, the greater its potential usually is for advanced progression. Some forms of congenital scoliosis are idiopathic, in much the same manner as other ages of scoliotic onset. In essence, the fetus seems textbook normal in all ways except for the spinal tendency to curve sideways. This scenario is rare, but does occur in a small number of babies. When this is the case, prognosis is generally better than when a defined pathological causation can be ascertained. Definitive contributing factors to congenital scoliosis include many structural abnormalities of spine and soft tissue anatomy. Spina bifida is a commonly linked condition, as is hemi-vertebra formation in the backbone. Segmentation failure of the spine can create unilateral bone fusions that do not organically separate as designed, preventing the spine from growing normally. Similarly, defects in spinal joint formation can create asymmetrical linkings between vertebral bodies, inciting scoliosis. In rare instances, structural muscular defect conditions present before birth can also create congenital varieties of functional scoliosis. These conditions are typically the most treatable and can generally be completely resolved with a single surgical procedure early in life. Some of the most desperate of all congenital scoliosis conditions can also be classified as neuromuscular varieties. Fetuses who suffer from serious neuromuscular disease from birth have a very high chance of facing the worst progressions of scoliosis, often leading to disability before life even gets a chance to take hold. Lifestyle, age and general health factors involving the birth mother can also contribute to scoliosis in their fetus, with older women and those who have drug and alcohol problems suffering far higher rates of scoliosis and general birth defects among their offspring. Since there is growing evidence that many cases of idiopathic scoliosis are linked to congenital spinal abnormalities that are present prior to birth, classification of side to side spinal curvatures is now a subject of much debate. Some doctors theorize that up to 50% or more of all idiopathic scoliosis has been set in motion prior to birth and is simply waiting to show itself as periods of tremendous growth occur. Although not proven, these theories do enjoy widespread support and account for some of the most debated of all scoliosis topics. Regardless of classification, the life-influencing results on the patients are the same, whether the condition is congenital or not. Continuing research will likely prove or disprove congenital relationships to idiopathic side to side spinal curvatures in the coming decades. Furthermore, research continues on the genetic link to scoliotic formation, as the condition is well known to run in family lines from one generation to the next.